Life is a precious, fleeting mist, that we all often take for granted, that is, until something tragic happens, that helps us put all the blessings in our lives in perspective. Exhibit A is the Carson Animal Shelter, in Gardena, California. Carson, a high kill shelter where hope, fades quicker than the end credits of a Hollywood film, is not the place one would wish on their own worst enemy. That’s because the dogs and cats trapped in this high kill facility are given just weeks, and sometimes even just days to find forever families before the unthinkable happens: euthanasia. Carson is a place that would bring the burliest of all men, and the hardened of all souls to tears. Just walking the halls of Carson, and peering through the eyes of the hopeless animals slated for “termination” is a life-changing experience, that will have you counting your blessings. For one dog name PRINCESS, life is as hard as it is ever going to get for her. 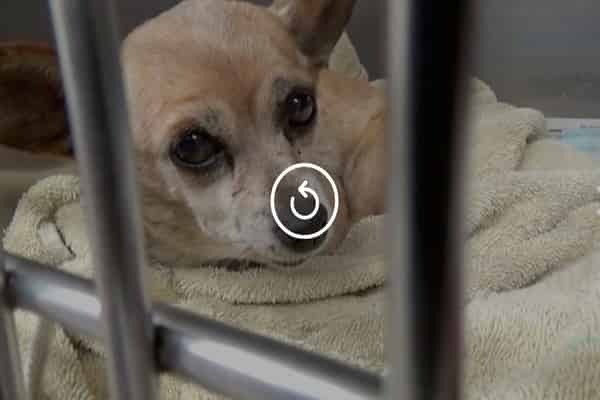 The 5 years old Chihuahua pup was mercilessly dumped at Carson, because her owner didn’t want to “deal” with a sick puppy, according to my confidential sources at the shelter. Sad Indeed. PRINCESS, who may know very well that her life behind a cage is not normal, is said to cry herself to sleep every night hoping and praying for a miracle. PRINCESS is taking it very hard that her family just left her. She is in the medical building and seems like a much older dog. She needs help fast to heal her broken heart. Please SHARE, she's SO special She need a FOSTER or ADOPTER NOW. Thanks! #A5116648 My name is PRINCESS and I'm an approximately 5 year old female Chihuahua. I am not yet spayed. I will be available on 9/30. You can visit me at my temporary home at C404. My former family who owned me had to give me up because their landlord wouldn't allow me. 1 Response to "Depressed chihuahua dumped at kill shelter by owner, is just too sad to care anymore"
What's the Medical hold for?